Sayed Ali Fadhul is a 16-year-old child who was arrested without a warrant by the Bahraini government, tortured, and denied a fair trial. Bahraini authorities arbitrarily detained Fadhul and continue to imprison him, enforcing his unjust sentence while conducting a new unfair trial against him. The Criminal Investigations Directorate (CID) summoned Fadhul multiple times in 2018, never mentioning the reasons behind his summonses. Furthermore, the CID targeted his education. Fadhul’s second summons was on the day he was scheduled to take his primary education certificate exams. At approximately 3:30 am on 10 September 2018, the morning of Fadhul’s first day of the new school year, Bahraini officers raided his home. They arrested Fadhul without a warrant and took him to the CID, where they detained him for 21 days. During his first two days of detention at the CID, officers blindfolded him, handcuffed him, deprived him of food and water, put shoes in his mouth, and subjected him to forced standing. If he fell or sat, officers beat him. After two days of starving and dehydrating Fadhul, the officers forced him to eat cheese. Since his throat was dehydrated, he could not swallow the cheese, so he refused to eat it. Consequently, the officers beat him. The authorities charged Fadhul with attacks on the security forces of Diraz and throwing a fake bomb in Sitra. After 21 days at the CID, the authorities transferred Fadhul to New Dry Dock Detention Center. Fadhul bore physical signs of torture, including marks on his forehead, where officers beat him with a paper hole punch. Additionally, Fadhul suffered considerable weight loss, loss of balance, and an abnormally high red blood cell count. On 28 October 2018, the authorities released Fadhul but maintained the charges against him and proceeded with trial. On 16 January 2019, Fadhul was in a car with his father near his home when officers swarmed Fadhul’s neighborhood and surrounded the car, forcing Fadhul out of it. Additionally, they raided his home and arrested Fadhul, taking him to the CID. The officers did not produce a warrant for any of their actions or even mention their reason for doing them. At the CID, officers bombarded Fadhul with questions about a fugitive who had been sentenced to death in absentia, and threatened a similar sentence for Fadhul. The officers also interrogated Fadhul about the two previous charges (the attacks in Diraz and throwing a fake bomb in Sitra). During the interrogations, officers tortured Fadhul. They beat him and shouted at him, including threats. The interrogation lasted three days, with each day’s session lasting eight consecutive hours. Fadhul spent about 20 days at the CID. On 5 February 2019, without notifying Fadhul’s lawyer, the authorities presented Fadhul before the Office of the Public Prosecutor (OPP). There, the government charged Fadhul with planting a fake bomb in al-Daih Town, organizing marches in Diraz in 2018, and illegal assembly and rioting. These new charges, combined with his previous two, brought the number of charges against Fadhul to five. The next day, the authorities transferred Fadhul to New Dry Dock, the detention center for individuals under the age of 21. On 13 February, a court convicted Fadhul of the charge relating to the attacks in Diraz. Fadhul was sentenced to six months in prison, a 200-Dinar fine, and the seizure of confiscated items. However, the court suspended execution of the verdict. The court acquitted Fadhul of the charge related to the fake bomb in Sitra, and the government dropped the charge of the fake bomb in al-Daih Town. Fadhul was not in court to hear his own conviction, as authorities did not permit him to attend the court session. On 5 March 2019, authorities transferred Fadhul and others to the court for a hearing on the charges of organizing marches in Diraz and illegal assembly and rioting. After the court session ended, everyone except Fadhul returned to New Dry Dock. The authorities instead took Fadhul to the CID. On 9 March, Fadhul called his family and told them that he was still at the CID. On 11 March, Fadhul called again to tell them that the authorities transferred him to the convicted section of New Dry Dock to serve his six-month sentence, despite the stay of execution. On 13 March, a court sentenced Fadhul to six months’ imprisonment regarding the illegal assembly and rioting case. On 21 March, without informing his lawyer, the officials transferred Fadhul to court, where he learned of three new charges against him: receiving training on weapons in and outside of Bahrain, participating in riots in Diraz in August 2018, and throwing Molotov cocktails and participating in arson in Bani Jamra in September 2018. He denies all of the charges against him. Fadhul remains at New Dry Dock. Bahrain has violated the International Covenant on Civil and Political Rights (ICCPR), the Convention against Torture and Other Cruel, Inhuman or Degrading Treatment or Punishment (CAT), and the Convention on the Rights of the Child (CRC), to each of which Bahrain has acceded. Additionally, Bahrain has contravened principles of international law enshrined in the Universal Declaration of Human Rights (UDHR). Officers arrested Fadhul without a charge or warrant, did not provide a lawyer or parental supervision during his interrogation at the CID, did not promptly bring him before a judge, tortured him, arbitrarily detained him, and denied him a fair trial. Additionally, the government continues to arbitrarily detain him by enforcing the sentence of a blatantly unfair trial. Furthermore, the charge of illegal assembly violates Fadhul’s rights to freedom of expression and assembly. 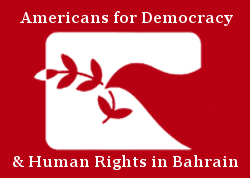 Americans for Democracy & Human Rights in Bahrain (ADHRB) calls upon Bahrain to end Fadhul’s detention, and if serious criminal charges can be maintained against him, ensure that any subsequent trial is consistent with due process and fair trial rights. ADHRB additionally urges the Bahraini authorities to investigate claims of torture and to provide adequate redress.